Starry probably won’t suffer the same fate as its founders’ previous venture, Aereo, which lost a high-stakes legal battle with broadcast television titans that ended at the highest court in the land. But in trying to change the way people access broadband Internet, Starry’s path to success is perhaps equally daunting. The startup, based in Boston and New York, splashed onto the scene with a press event in Manhattan last week. It will start selling its first product—a sleek, high-end Wi-Fi router that also manages a variety of connected devices—on Friday. The “Starry Station” will begin shipping to customers in March, the company says. 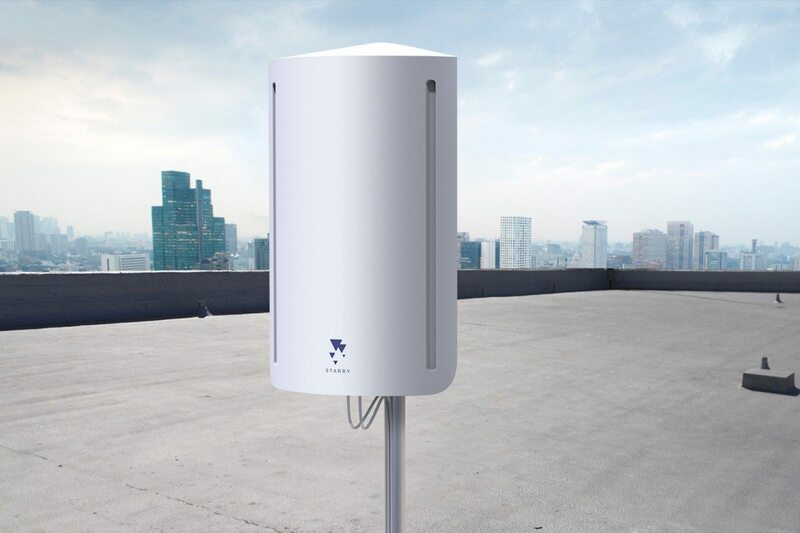 But the more ambitious piece of Starry’s business won’t start rolling out until this summer, when the startup begins building a nationwide broadband network that it says will wirelessly deliver Internet speeds of up to 1 gigabit per second to people’s homes. It’s focusing on metropolitan areas with dense populations. Wireless broadband technology isn’t new, of course. As The Verge reported, a group of such companies first cropped up in the late ’90s, but they fizzled out because they didn’t get the technology or business model right. A newer wave of wireless Internet providers have opted to build their businesses methodically, but they remain niche players. San Francisco-based Webpass, for example, hasn’t taken a dime from venture capitalists in its 13-year history, and its service is now available in five cities. Another competitor, six-year-old NetBlazr, raised nearly $1 million from investors last year and is available in the Boston area. Starry founder and CEO Chet Kanojia. Photo by João-Pierre S. Ruth. It’s way too early to tell if Starry can deliver on its promises. In talking with competitors and industry observers, the two biggest questions are whether Starry’s technology will work as well as it claims, and whether it can build out its infrastructure without burning through all of its cash. But some in the field are skeptical. “I don’t think that’s going to work as well as they think,” says Brough Turner, NetBlazr’s co-founder and chief technology officer. The Verge also interviewed two professors and a wireless industry consultant who expressed skepticism that Starry could send a reliable enough signal without installing more base antennas in closer proximity to the receivers outside customers’ windows. Obviously, Kanojia is confident Starry has figured out how to make it work. “The clever part that we did is this phased array part, which allows us to manage how we steer” the Internet signal, he says. Starry will get a chance to prove the technology works (and to fix any problems) this summer, when it starts testing it in the Boston area. If successful, Starry intends to expand to more as-yet-unannounced cities.